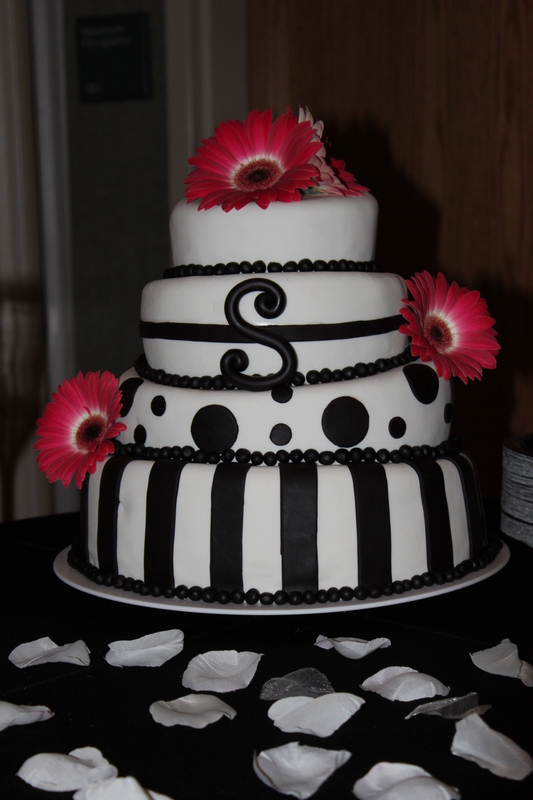 This black and white topsy turvy wedding cake was for Courtney’s friend Nicole. It came out pretty cute! The bottom layer is chocolate sour cream and the next layer up is vanilla sour cream (both from the “White Almond Sour Cream Cake” recipe on the blog) and the top 2 layers are brown sugar (from “Gram’s Best Brown Sugar Cake” recipe also on the blog). I of course used my favorite Vanilla Buttercream Frosting and then the white fondant is White Vanilla Satin Ice fondant (ordered on line) and the black is Duff’s from Michaels. Not thrilled with the Satin Ice fondant, I think the Pettinice works better and looks better but Funfinity was all out, bummer. Nicole ordered the flowers for us so that they matched the rest of her flowers. Congratulations Nicole and hubbie! wow..lovely cake! i can only dream of making such cakes ! 😛 haha…i am always in awe of good frosting.